The political strategist talks about why both parties are terrified of their presidential front-runners and says the fiscal picture is brighter than many observers think. Valliere says the U.S. fiscal picture is a lot brighter than many think. Political analyst Greg Valliere says this “a great time to do what I do.” In fact, the expert believes today’s political events are unlike anything he’s seen before. 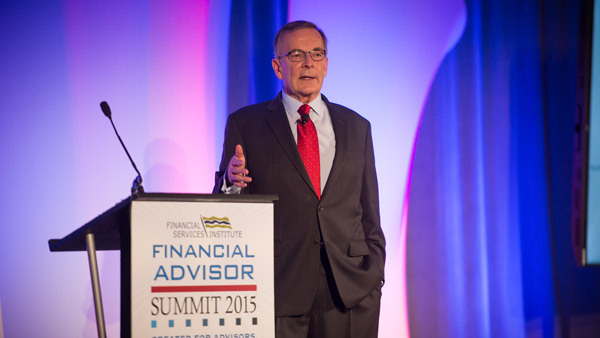 “It’s like 13 unassisted triple plays in baseball right now,” said Valliere on Monday during the Financial Advisor Summit 2015 in Washington, which was hosted by the Financial Services Institute and drew about 150 advisors and 150 other guests. Looking out to the 2016 elections, Valliere says it is likely to be a contest between Hillary Clinton and Marco Rubio, or possibly Ted Cruz or even Ben Carson. If the payroll figures for nonfarm jobs are good this month and next, rates could rise, spelling the end to the uncertainty and “annoyance” of the current situation, he explains. While Republican presidential candidate Donald Trump complains about “the stupid people” running Washington, Valliere says it was not a lack of intellect but a lack of votes that meant the Republicans couldn’t stop either President Barack Obama’s health care reforms or his nuclear deal with Iran. The good news for Congress and the American public, he says, is that Paul Ryan was picked to lead the Republicans in the House, “and we have a budget deal.” The deal includes the lifting of some spending caps, which come conservatives do not like. He’s also bullish on what spending on health care research could mean for the industry. With Ryan’s move into the role of House speaker, Valliere does not expect immigration reform to move ahead. “He will not allow that to happen in the House,” the analyst said. Corporate taxes, at 35%, need reform, but again there is no consensus on how this could happen. “You will hear more about this from Ryan,” who is interested in looking at the issue of profit repatriation and has suggested that this income be taxed at 6%-8%, he said. Such a plan “could really help drug, technology and other companies … It could boost mergers and acquisitions, and more tax revenue could then go the infrastructure. Ryan … is passionate about … improving our highway system, bridges and cybersecurity,” he said. The political expert does not expect Congress to raise taxes or change the tax treatment of carried interest over the next several years. As for entitlement reform, Ryan may push for this to happen with respect to Social Security cost-of-living adjustments, for instance, but not before the presidential elections — if his fellow Republicans have their way. “Wining in Florida takes precedence over reform,” Valliere explained. On the Democratic side of Congress, both Bernie Sanders and Elizabeth Warren are eager to increase Social Security benefits, he says. The Democrats seem to have a “clear favorite” nominee in Hillary Clinton. “I don’t see a 74-year-old Socialist” as the nominee he said, referring to Sen. Bernie Sanders of Vermont. But many Democrats have “big concerns” about Clinton, namely that more disclosures about her different email accounts or issues with the Clinton Foundation will come to light, according to the analyst. The Republican Party is in a “venting phase,” Valliere says, since many voters are angry. Thus, there are three outside candidates – Donald Trump, Ben Carson and Carly Fiorina. When looking at which Republican candidate can actually win the White House, Valliere names, from most to least likely: Chris Christie (“an outside chance” ), John Kasich (“Democrats like him, which is a curse not a blessing), Jeb Bush (who needs to “get off the decaf and get some espresso”), Ted Cruz (who knows how to “throw red meat at the Republican base”) and Marco Rubio (“a brilliant speaker and charismatic politician who connects with middle-class voters”). As Trump fades in the polls, Cruz benefits, Valliere says. But if the election were run like an NFL draft pick for the best player, Valliere would select Rubio. “He talks Reaganesque, about the future, with an inspirational story to tell… Yes, he is 44 and looks younger. He is the candidate to watch,” the political expert explained. Some Hispanics may like Rubio, but the rhetoric against immigrants expressed by Trump has been inflammatory. Also, “Rubio liked immigration reform, and then he ran from it when he saw [some] polls,” Valliere said, lessening his appeal to Hispanics overall. As for Congress, the impact of redistricting and other shifts means the House is “going to stay deeply conservative for several years, according to Valliere. The analyst joked, “If the election pitted Clinton vs. Bush, people with 20-year old cars wouldn’t need to change their bumper stickers.” But, on a serious note, he adds, that matchup would likely mean that many people will not vote. Whereas Rubio is “the most electable Republican because he looks to the future, Hillary and Bush “look to the past,” said Valliere. He thinks Rubio should run with Kasich, so Florida and Ohio – the states the two politicians represent – could go to the Republicans. What keeps the Washington observer up at night? Unfunded liabilities in places like Detroit, Puerto Rico, Chicago and Illinois as a whole, he says: Chicago Mayor “Rahm Emanuel has to raise taxes, slash benefits or both. It’s quite frightening.” Still, some states like Iowa have confronted budget issues head on, with creative measures. In addition, there are federal regulations “flooding in,” since President Obama can’t get much done in Congress. “The coal states are upset about new rules, as is your industry about the proposed [Department of Labor] fiduciary standard,” said Valliere.